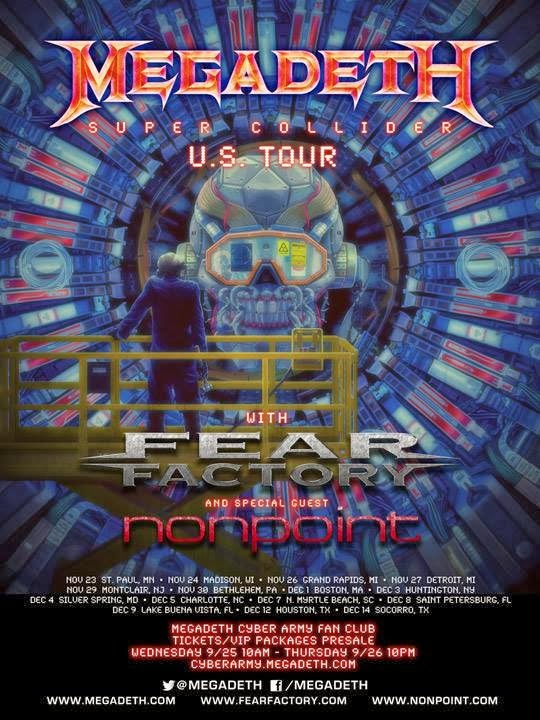 Megadeth have announced the Super Collider US tour, which will kick off November 23 in St. Paul, MN. The dates follow the spring release of their latest album, “Super Collider”, the band’s own Gigantour, and sold-out shows with Iron Maiden and Black Sabbath. Joining Megadeth on the trek will be openers Fear Factory and Nonpoint. 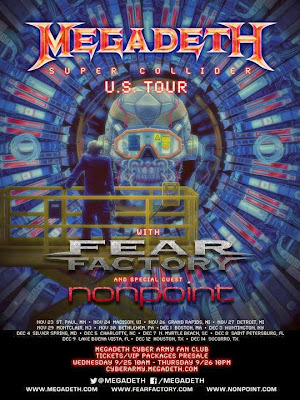 Megadeth's Cyber Army fan club exclusive tickets presale and VIP packages presale begins Wednesday, September 25 at 10 a.m. and ends Thursday, September 26 at 10 p.m. local time. Presale details will be provided to club members at cyberarmy.megadeth.com. Megadeth will join Black Sabbath for a Latin American tour starting October 4 in Santiago, Chile.